Many congratulations to Oliver Garner who has been awarded the Tom Halliday scholarship for 2011. The Tom Halliday Award was set up by Market Rasen Racecourse in 2005 following the tragic death of conditional Tom Halliday. The award was designed to help young and up and coming conditional jockeys and this is the first time that it has been awarded to an amateur jockey. The award offers a promising young jockey support in a number of ways including sponsorship, coaching, media training and access to other areas of advice to support his or her career. Pip Kirkby, Market Rasen’s MD, said “This award means a lot to those who receive it and we very much intend to include the views of senior jockey Dominic Elsworth, a long time friend of the Halliday family, as well as James Halliday in making the decision as to who should be the next scholar. DANCE FOR ISABEL AND RICHARD! Saturday 3rd December! This year the AJA Champions Cheltenham Christmas Dinner Dance will be dedicated to raising funds for both ISABEL TOMPSETT and RICHARD HAWKINS who continue to recover from serious head injuries sustained earlier this year. Similator Fall Training: learn how to bounce back! 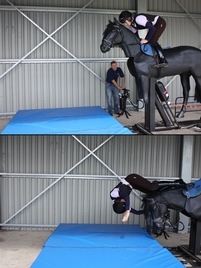 The equipment at The British Racing School is to be used in conjunction with training. The machine, the first of its type in Britain, works on compressed air and therefore speed and severity of the fall can be regulated. Integrated into the Course Programme is a series of sessions looking at the technique to minimise injury. The sessions will be taken by Jon Pitts and Steve Smith Eccles. Spaces are available for the next training course on Tuesday October 11th. The course includes an introduction and briefing, technique practical session and technology to analyse falls from the Equichute and costs £75. For further information and/or to book your place please contact Clare Higgins on 01638 665103 or 675907 or e-mail clare@brs.org.uk. BHA agrees to contribute to AJA for amateur jockeys’ wins v professionals at last! The British Horseracing Authority (BHA) has today announced it will share the benefits of the income it generates from amateur jockeys riding against professionals with the Amateur Jockeys Association for the very first time. 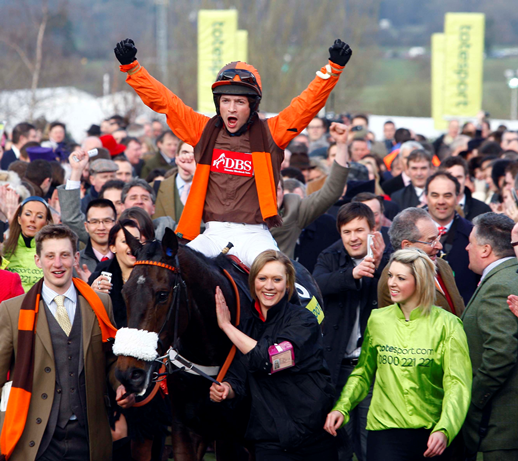 Whilst the BHA already supports amateur jockeys through a contribution towards the provision of insurance and funds industry training and on-course physiotherapists – totalling in excess of £450,000 over the past four years – a major proportion of future prize money and riding fees earned by amateur jockeys will now be shared with the AJA. 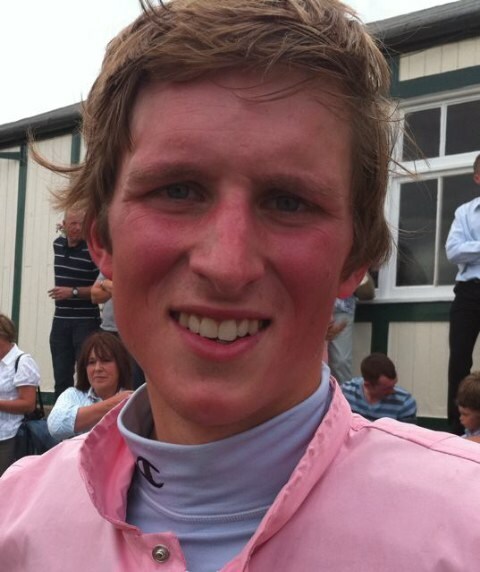 In addition, the outstanding achievements of Sam Waley-Cohen in becoming the first amateur jockey in 30 years to win the totesport Cheltenham Gold Cup and finishing second in the John Smith’s Grand National in 2011, have enabled the BHA to provide a further £30,000 grant to be divided between the AJA, the Pony Racing Authority (PRA) and to Sam’s newly-founded charity, the Thomas Andrew Waley-Cohen (TAWC) Fund, which is aimed at providing financial support for charitable initiatives across the country. £20,000 of this grant has been allocated to the AJA towards funding for a small number of valuable Jump races for amateur riders, which will be planned in consultation with BHA Racing Department and the racecourses concerned, with the hope of building a stronger platform from which amateur jockeys can launch their riding careers. Many congratulations to our Fegentri lady jockey RACHEL KING who has just won in Istanbul to take her into 2nd place in the rankings for the Ladies Fegentri World Championship 2011. This is great news for Great Britain! Let’s hope Rachel can go one better than the gallant attemps of our previous lady representatives who have taken the runner-up slot over the past three consecutive years: Gemma Gracey-Davison (2008), Claire Allen (2009) and Ruth Jefferson (2010). Watch this space!